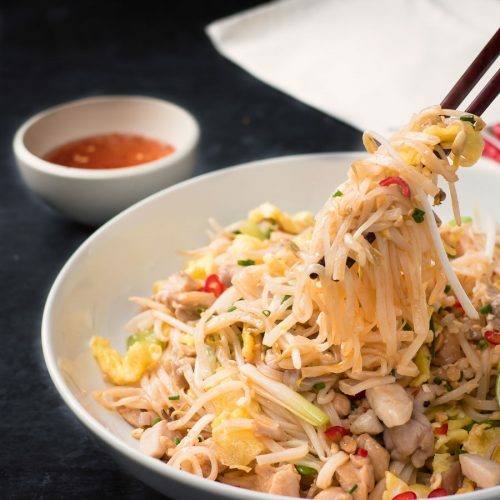 Chicken pad thai is a great weeknight meal when you are craving something a bit special but don't have a lot of time. Place the rice noodles in a large bowl. Add hot water to the top of the bowl. As hot as you can get it out of the tap. Let sit 20-40 minutes. A longer soak will just mean a slightly shorter cooking step later on. If you are jammed for time boiling water for 5-10 minutes works OK as well. Combine the chili vinegar sauce ingredients. Stir to combine. Set aside. Combine the pad thai sauce ingredients. Stir to combine. Set aside. Beat the eggs (use a fork) until they are an even yellow colour. Chop the chicken into 1/2 inch pieces. Heat 2 tbsp oil in a 12 inch non-stick skillet over medium heat. If you have a wok you can drive over high heat use that. My stove and my wok don't play well together. Add the chicken and garlic and stir fry until the chicken is just done. This takes about two minutes. Be careful you don't let the garlic burn. Turn the heat down a bit and push the chicken to one side. Pour in the beaten eggs and film the bottom of the pan. You want it spread thin. Cook until the eggs just set up. Cut them into ribbons with your spatula. Transfer the chicken egg mixture to a bowl and set aside. Add the remaining two tbsp oil to the pan. Pre-heat again over medium heat. Add the noodles. Stir fry until the noodles soften. They will start to clump together when they are ready. Taste to make sure. You want them ever so slightly toothy. That's perfect. Push the noodles to the side of the pan. Add the bean sprouts and green onion along with the last tsp of oil. Stir fry for about 30 seconds. Start to try to work the noodles and bean sprout mixture together. This isn't as easy at it sounds. As soon as they are mixed sort of evenly add the pad thai sauce. Stir to combine. Add the egg mixture back into the noodle mixture. It should still be hot but if not cook for about 30 seconds to warm through. Divide into 2 bowls. Top with chopped peanuts and red chilies. Serve with lime wedges and chili vinegar sauce.